Twenty-eight years old, first appearance: Volume 1. He’s the owner of several establishments and businesses, including the Blue Boy, the gay dating club responsible for Izumi and Takamiya’s happiness together. He’s also a long-time friend of Takamiya’s. Aoe is work-obsessed and often cold to those around him (particularly Izumi), but his actions and words always mean well. 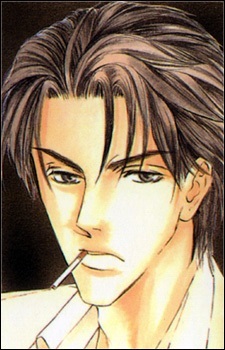 Reiji himself had topped the polls for the favorite seme in Biblos during Love Mode's run.